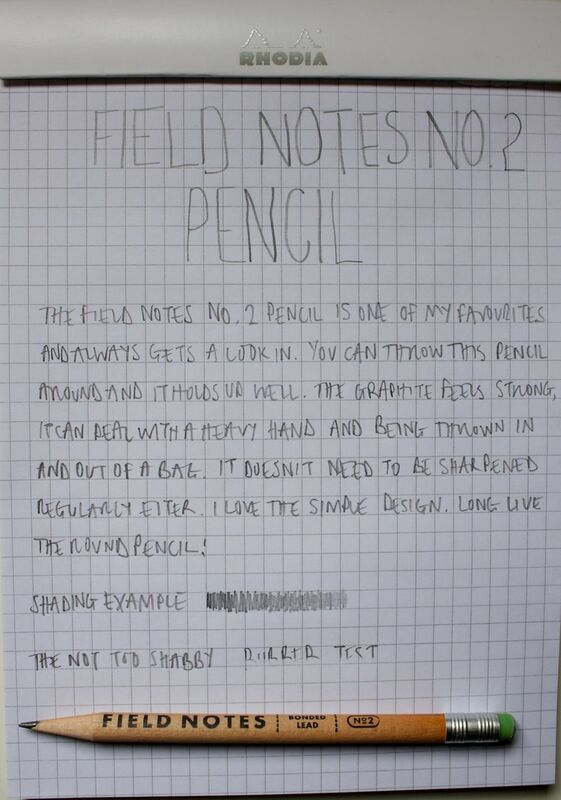 The Field Notes No.2 pencil was one of my first ventures into the world of pencils for a very, very long time. Before this I had one brand of pencil in my pen pot (back then it was predominantly a pen pot) and even then there were only 2 of them, the Faber-Castell Grip 2001. My pencil usage back then was minimal. But then along with my Field Notes colors subscription came the odd pencil here and there. And slowly I started using them, a bit at first and then slowly I was choosing to use them more often. As with a lot of Field Notes related ephemera it was simple, not over the top - a simple classic pencil design. The No. 2 pencil has a natural round wood pencil. A silver ferrule. A green rubber. That's it. There is an informative 'About This Pencil' section on one side of the pencil. Finding a round pencil seems to be fairly unusual and this just adds to the pencils charm. The graphite in the Field Notes No. 2 pencil is great. It's soft, not too dark. You can press as hard as you like. For writing or sketching out basic drawings it works well. For anything seriously artistic this pencil won't do what you need. As with most of the Field Notes merch they have just got this pencil right. I am not sure where, or who makes these pencils, but they do it well. The rubber provides a quirky edge, something that shows that Field Notes has some personality but also a colour that I haven't seen on any other pencil. I currently have a number of lose pencils which I have acquired over the 18 month Field Notes relationship I have been in. And these pencils get used, because they're good. I think I may be becoming a bit of a pencil addict. My love for them continues to grow.